Friction is immensely important to us – without it, for example, we could not walk or even crawl – yet it is only 50 years since a special word – 'tribology' – was first coined to describe its study. Professor Ian Hutchings has recently had a paper published on Leonardo da Vinci and his studies of Friction. The first systematic study of friction dates back more than 500 years to Leonardo da Vinci. That much has been known for some time, but Professor Hutchings has now identified the notes and sketches in which Leonardo first recorded the laws of friction, and has shown that he went on to apply them repeatedly to various mechanical problems for more than 20 years. Based on a detailed study of Leonardo da Vinci's notebooks, Professor Hutchings' research examines the development of Leonardo's understanding of the laws of friction and their application. His work on friction originated in studies of the rotational resistance of axles and the mechanics of screw threads, but he also saw how friction was involved in many other applications. He pursued the topic for more than 20 years, trying to use his knowledge in models for different mechanical systems. Well-known diagrams which have been assumed to represent his experimental apparatus are misleading, but his work was undoubtedly based on experiments, probably with lubricated contacts. Although his work had no influence on the development of the subject over the succeeding centuries, Leonardo da Vinci holds a unique position as a pioneer in tribology. This page, from a tiny notebook (92 x 63 mm) now in the Victoria and Albert Museum in London, dates from 1493. It contains Leonardo's first statement of the laws of friction. The sketch of the old woman and the writing in black pencil were added later. 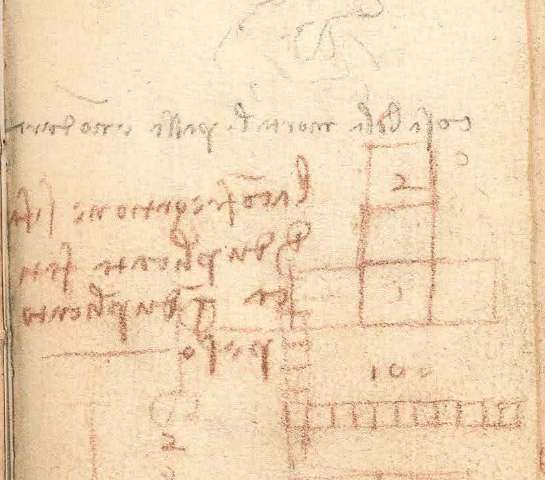 What is fascinating to a tribologist is the writing in red chalk – in Leonardo's characteristic 'mirror writing' – and the rough geometrical figures underneath. Leonardo's interests and talents were phenomenal – not only as an artist, anatomist and designer of machines, but also in trying to make sense of the mechanical and natural world in which he lived. He realised that friction, while sometimes useful and even essential, also played a key role in limiting the efficiency of machines, just as it still does today.